An alpaca is an animal, a member of the camelid family, as are camels, llamas, vicunus and guanacos (other animals similar to alpacas that live in South America). Llamas are much, much larger than alpacas, they have curved (banana-shaped) ears as oppossed to the straight (spear-shaped) ears of the alpaca. Alpacas have been breed for many generations to remove the course 2nd coat that most llamas have. This makes their fleece ready to be used directly without having to remove coarse hairs. Why do people breed alpacas? Alpacas are produced primarily for their amazing fleece, that comes in more natural colors than any other fiber animal produces. The fleece is shorn off the animals once a year in a process that doesn't harm the alpaca. Each year, an alpaca produces from two to eight pounds of lovely, soft fleece. Plus, being one of the most interesting, unusual and adorable animals on earth, they offer the possibility of profit while enjoying a relatively easier farm lifestyle (as opposed to raising vegetables for example). Demand and supply factors in the U.S. have created comparatively high prices for each alpaca, meaning that breeding and selling their offspring offers another viable means of profit in addition to selling the fleece that is sheared off alpacas annually. Yes. Alpacas do spit sometimes. It's a defense mechanism that they use, generally on other alpacas, but occasionally on people too. If you approach them carefully and respect their space, it's usually not a problem. Alpacas are really adorable to look at, but they aren't disposed to behave at all like cats or dogs, and don't make good domesticated pets. Also, alpacas are herd animals by nature, and a single alpaca by itself will be very unhappy, so be sure to always have at least two alpacas. Alpacas can live for up to about 20 years. How quickly do alpacas reproduce? Alpacas reproduce very slowly, each female producing at most one offspring per year. Twins rarely ever make it to maturity. The slow reproduction rate, keeps the supply down and prices good. Females are ready to breed as early as two years of age. Males are typically not ready to breed before three years of age. How much land do you need to raise alpacas? The answer to this question depends on your farm management practices. If you want to feed the alpacas primarily from the pastures they graze, you'll need a lot more land. But if you are going to bring in hay and grain, then you can have more alpacas in a smaller space. Fewer alpacas per acre also means more intensive poop cleanup efforts. You might also need to check with your local legislative offices to find about any restrictions on the land use in your area. As a benchmark, you could comfortably have up to 12 alpacas per acre with poop cleanup one to times per week, bringing in hay and alpaca feed to supplement grazing. What do you do with alpaca fleece? Alpaca fleece can be sent directly to a mini-mill and made into exquisite yarn for knitters and crocheters, or into rovings for hand-spinners. It can be sent to mills that weave rugs, or make blankets. It can be delivered to fiber cooperatives that create end products like socks, blankets, scarves, and hats. Eventually, as our nation's infrastructure expands to handle the conversion of large volumes of fleece into end products, the fiber can be sold in bulk to manufacturing companies. 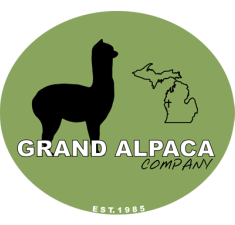 Here at Grand Alpaca Company we can offer you fiber or companion alpacas, starting at $500, and quality breeding alpacas, starting at $1,500, with special discounts on multiple purchases. How do you get started raising alpacas? It's a good idea to visit several alpaca farms and learn as much as you can about it by talking to alpaca farmers. If you can make it to our farm in Michigan, and you're thinking of raising alpacas, be sure to schedule a visit. Why buy your alpacas from us? We have more than 90 alpacas to choose from, learn more about what we have to offer at our Michigan alpaca farm.